IDeaS team was at the Global Conference in Economic Geography, Köln 24-29.07.2018 presenting preliminar results of the research. Having completed interviews in four of the six case cities, in Boston, Turku, Medellín, and Bangkok, we observed some characterizations for Innovation Districts in advanced cities compared to those in cities in emerging economies. Innovation Districts in cities in advanced economies are set to intensify the existing creative urban life by facilitating a 24/7 inventive mode. They exacerbate the ‘being there’ by planing hip neighborhoods with desirable working, living, and entertaining properties. Innovation Districts in cities in emerging economies are set aiming to leapfrog into technological futures. The introduction of the concept clashes with aspects of the prevalent culture and the socioeconomic realities of the surrounding communities. To study the traveling process of the ‘Innovation Districts’ concept, we considered three dimensions. 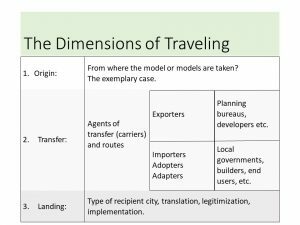 These dimensions consider the process of traveling from the introduction of the concept until the emergence of the innovation district. This stepwise differentiation of the process allows us to better understand the uniqueness of the landing in each city. The origin considers the exemplary cases from where the reference model o models of Innovation District are taken. The transfer considers the carriers (or agents of transfer) and the routes taken by the concept to being exported or imported. Exporters can be international planning bureaus, developers, think tanks, policy advocates, etc. Importers/adopters/adapters can be local or national governments, builders, end users. 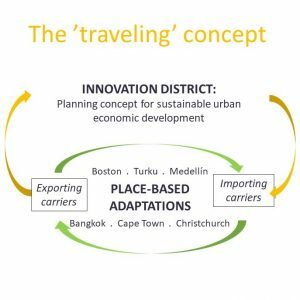 The Landing is a complex process influenced by the type of city, the translation of the concept made by the carriers, the success of legitimization processes (to get support for the Innovation District), and the resources and constraints to implement. These are also influenced by the diversity of agents involved at each stage of the landing and the policy goals and interests the ‘Innovation District’ represent for them. This entry was posted in Uncategorized on August 8, 2018 by olgoch. Innovation District (ID) is a new urban planning concept that corresponds to contemporary changing work lives and life-styles. As appealing environments for creativity-inducing interactions, IDs are expected to attract talent and investments and to have a bearing on the urban economy. IDs respond to the economic imperative to create spaces of innovation that bring together scientists, innovative start-up teams, agile corporate units, business incubation, and spaces for interaction in close proximity. Leading-edge activities are facilitated by housing, services, and efficient transport. IDs can serve as hotspots for sustainable urban development. IDs are in place and emerging in cities worldwide, adapted to local economic, institutional, and built environments. This entry was posted in Uncategorized on August 6, 2018 by olgoch.